Registered in the Chinese Armorial on February 22, 2019. Arms: Gules three Pallets Or surmounted by three Roundels in bend Azure each charged with a Rose Or barbed proper seeded Gules. Crest: Upon a Helm with a Wreath Or and Gules. A Swan rising supporting between the Wings elevated and addorsed Or a Wheel Gules Mantled Gules doubled Or. Badge: A demi Horse couped Azure sans tail supporting between the legs a Sword palewise Or the blade surmounted by a Wheel Gules. Standard: A standard the Arms in hoist, the fly Argent charged with the Crest between two representations of the Badge separated by two bends Argent fimbriated Azure and inscribed with the Motto. 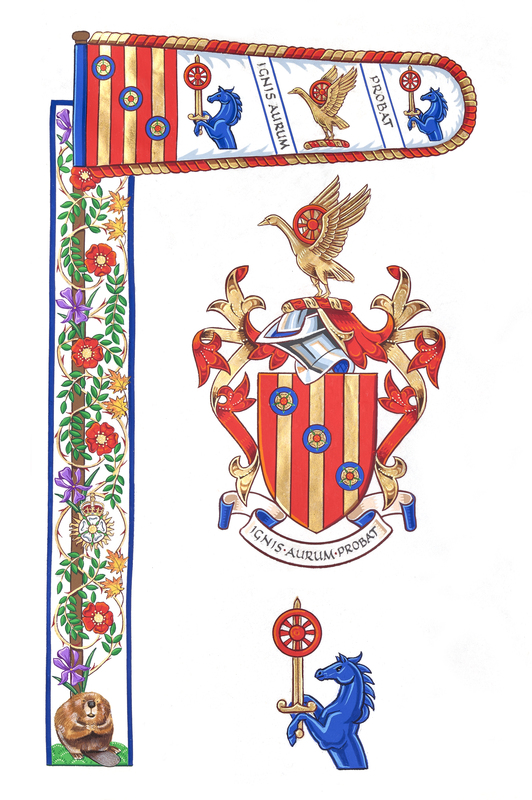 Grant: coat of arms, badge, and standard: College of Arms, July 27, 2018. The lines represent connectivity, networks and trade routes (alluding to a career in information technology and global trade), the Partition of India (alluding to the flight of the armiger's father as a Sindhi Hindu refugee to the Dominion of India), and prison bars (alluding to mother being born in Butterworth, Province Wellesley, during the Japanese Occupation of the Straits Settlements). The yellow lines represent the abacus (alluding to the paternal Shikapuri history in banking and trade, a career in banking & business, and Straits Settlements Chinese Hokkien maternal lineage) and bamboo, symbolizing integrity and flexibility. Red and yellow represent wealth in Chinese culture. Red is a national colour of Canada, England, Croatia, Poland, Malaysia, and China, and blue and yellow are the national colours of Bosnia. These colours represent the family’s ancestry. The three roses represent the wife, son, and daughter, and the family’s English heritage. The crest's swan alludes to the Hansa or Hamsa ( Sanskrit: हंस ), the vahana (bird of passage) ridden by Saraswati, the Hindu goddess of knowledge, music, art, wisdom, and learning. Its taking flight is symbolic of the seeking of enlightenment and of migration (alluding to the armiger's childhood migration from London to Toronto, father’s migration to London from Bombay, mother’s migration from Penang to London, his wife’s migration from Zagreb to Toronto, his wife’s parent’s migration from Bosnia to Croatia, his wife’s ancestors migration from Galicia to Bosnia, and the migration of the Aryans from Central Asia). Yellow represents Gold, symbolizing wealth and integrity. The Wheel alludes to the Dharmachakra. The badge's horse represents the Canadian horse (alluding to the son’s & daughter’s birthplace), symbolizes grace under pressure, and alludes to a family history with horses and horse racing. The upright Sword represents the City of London, support for the Armed Forces of the United Kingdom and Canada, and the defense of family and home. The Wheel alludes to the Dharmachakra.